The last transit of Venus across the sun for 105.5 years begins in less than 24 hours. As I wrote last time, past transits were a scientific bonanza, allowing astronomers to determine the size of the solar system and, eventually, distances to other stars. But in a time when we have spacecraft orbiting Venus, can a transit still provide a scientific return? The short answer is yes. We don't expect to learn any groundbreaking new facts about Venus, the Sun, or the Solar System. But we can use the fact that we already know so much about these objects to make use of this transit by testing our techniques to study planets around other stars. One of the main techniques astronomers use to study planets around other stars is called the transit method. A tiny fraction of planets around other stars have their orbits oriented just right so that they pass between their parent star and our view from Earth. We can't see the dark spot of the planet crossing the star from dozens of light years away, but we can measure a tiny drop in the amount of light from a star. NASA's Kepler Mission uses this technique in its search for Earth-sized planets around other stars. When planets are discovered by the transit method, we have to infer a lot of the planet's properties. There are sources of error, including what we know about the parent star, how active the parent star may be, what the parent star looks like in detail, and so on. From our vantage point on Earth, the Venus transit will have similar properties to a Neptune-size planet transiting a sun-like star (since we are close to Venus, it appears larger in proportion to the more distant Sun than it really is). So, we can test all sorts of sources of error and uncertainty. The Hubble Space Telescope will use the transit to test how we probe atmospheres of extrasolar planets. Venus has a thick and cloudy atmosphere, and we know what that atmosphere is made out of. Some of the light from the sun will pass through Venus's atmosphere and pick up some information about the atmosphere's composition and structure. Astronomers have used this same technique to probe the atmosphere of planets around other stars. 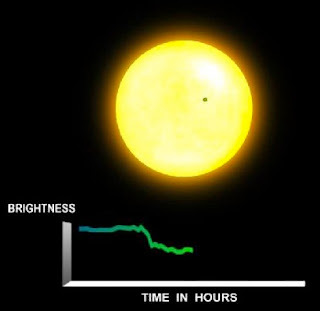 Since we already know what Venus's atmosphere is like, we can use the Hubble observations to try and recover that answer, and see how good (or bad) our current studies are.